Puerto Vallarta is one of the most popular tourist destinations in Mexico. The big attractions are the white sand beaches, chic hotels, buzzing nightlife and excellent gastronomy. It’s considered to be a top foodie destination in Mexico, second only to the capital city. Needless to say, it’s also something of a gay mecca. I wanted to see what all the fuss was about so I went to investigate. Did it live up to expectations? You bet it did. Why Is Puerto Vallarta So Popular? John Huston filmed his Tennessee Williams adaptation, The Night Of The Iguana, in Puerto Vallarta in 1964. The stars of the film were Richard Burton and Ava Gardner. Burton had just filmed Cleopatra with Elizabeth Taylor. Their stormy relationship began on the set of that film, but rumour has it that they fell in love in Puerto Vallarta. Taylor did not participate in the John Huston film, but she nonetheless flew in to keep an eye on Burton. They soon fell in love with the town (as well each other). Burton bought two properties near the malecón, one for him and one for Taylor. They called the property Casa Kimberly and connected the houses with a bridge. A bridge designed, no less, to look like Venice’s Bridge Of Sighs. So far, so romantic. The presence of the world’s most famous couple put Puerto Vallarta on the map. It became a hotspot for the North American elite. Burton and Taylor had a lifelong love affair with Puerto Vallarta that survived two marriages (to each other), vast amounts of booze and many legendary rows. After Taylor died in 2011, Casa Kimberly was sold and turned into a luxury boutique hotel. You can stay in her former bedroom, the Elizabeth Taylor suite. It will set you back four thousand bucks a night. If you can’t afford to stay in Elizabeth Taylor’s bedroom there is hope yet. 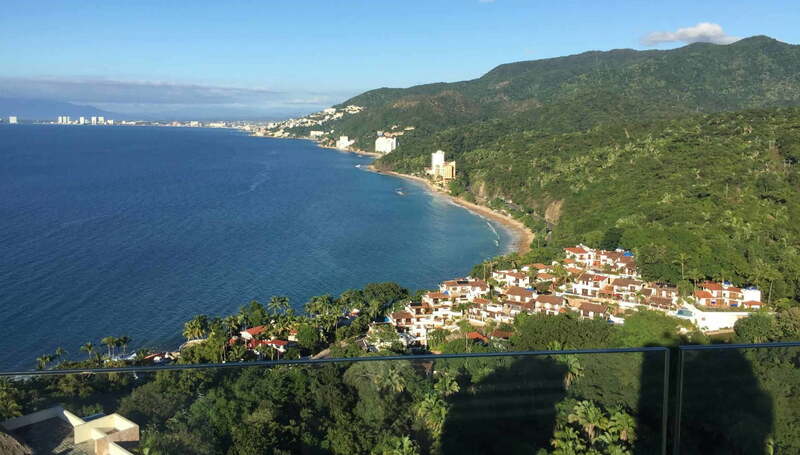 Puerto Vallarta boasts many stunning hotels, and I was able to visit many of them. A perennial favourite for Out Of Office travellers is The Almar Resort. It’s a luxury gay hotel that bills itself as “straight-friendly”. The Almar is located in the heart of Puerto Vallarta right by Zona Romantica, the legendary gay district. I enjoyed a boozy meal at the hotel’s popular Top Bar. They served us cocktails in giant lightbulbs that had steam coming off them (see below). We wined and dined as two drag queens performed ABBA and Tina Turner songs. The rooftop bar overlooks the bay. You can hear the noise coming from the bars below, heralding the start of your legendary night out in Puerto Vallarta. The Almar is a very popular place for honeymoons and party vacations. If you’re looking for total luxury Hotel Mousai is the place to be. It’s the only AAA Five Diamond resort in Puerto Vallarta. The suites are very regal and the rooftop bar is stunning: the infinity pool really does seem to go on forever. Another great luxury option is Casa Velas, located in Marina Vallarta, it’s currently seeking to attract more LGBT guests. The mile-long malecón is the heart of Puerto Vallarta. As you stroll down it you’ll see many striking sculptures by local artists. Check out Galería Uno and Galería Colectika. Mexican art is very distinctive, often combining vivid colours with indigenous imagery. You’ll find a lot of street art throughout the city. As you make your way along the Malecón you’ll see the Church of Our Lady of Guadalupe, one of the city’s major landmarks. Make sure you eat as much as you can while you’re in town. The local food scene is fabulous. Grilled octopus tacos are a thing and they taste really good. You can wine and dine at La Palapa, an excellent restaurant on Los Muertos Beach. The street food is also very popular and ideal for soaking up hangovers. A boat tour around Banderas Bay is an absolute must. You can stop off at secluded local beaches like Majahuitas, and snorkel in the clear waters of Los Arcos. Zona Romantica is the place to be. It’s the largest “gaybourhood” in Latin America. Our gay night out in Zona Romantica began, quite by chance, in Reinas, a bar that doubles as a tacky homage to the British royal family. You’ll find pictures of the Queen and Princess Diana on the walls. There are even pictures of David Beckham in the toilets. It’s one of those bars that elevates bad taste into an art form – in a charming way, I hasten to add. We then moved on to Mr Flamingo, one of the most popular gay bars in Puerto Vallarta. It’s the epicentre of Zona Romantica. As the night progresses, it gets very busy and you’ll see people to spilling onto the streets. No gay night out in Puerto Vallarta is complete without a trip to Paco’s Ranch, widely considered to be the best gay bar and club in Zona Romantica. As we made our way through the crowds we saw a fierce drag queen performing as Beyonce with a group of well-drilled dancers. It was quite a production, like a finale on Rupaul’s Drag Race. The gay scene in Zona Romantica is on a par with Hell’s Kitchen or London’s Soho. If you like nightlife, you’ll do well here. Just go easy on the tequila! It’s difficult to date when LGBT tourists began to discover Puerto Vallarta, but it was clearly sometime after Elizabeth Taylor arrived. Although historically a conservative, Catholic city, the locals have overwhelmingly welcomed the LGBT tourism boom. Most of the hotels I visited have had LGBT sensitivity training. Many, like Casa Velas and the Marriott, are actively seeking to attract LGBT guests. Our host at the W Hotel boasted about the number of gay weddings and honeymoons they’ve hosted. Do They Speak English In Puerto Vallarta? A resounding yes. As the tourist industry employs around fifty percent of the locals, most businesses to cater to the North American market. Besides, a lot of Mexicans learn English after spending time north of the border and by watching American films. Puerto Vallarta is a quintessentially Mexican town, and yet it has an international vibe. That is, in no small part, what makes it so charming. Is It Safe In Puerto Vallarta? I asked the very same question to a lady from the local tourist board. She said that she felt safer in Puerto Vallarta than in London. Safety is a concern for many travellers in Mexico. The drug wars have brought carnage to many parts of Latin America. Mexico is, however, a vast transcontinental country that cannot be defined by one conflict. Many parts of the country are safe. Puerto Vallarta has the highest property prices in Mexico and it’s the second home of many wealthy North Americans. It’s about as safe as you’re likely to get in the region. The vast Sierra Madre surround Puerto Vallarta. As you’re flying in towards the local airport you’ll be dazzled by them. These mountains protect Puerto Vallarta from hurricanes. The mountains are so vast they essentially eat the hurricanes before they reach the town, making it a safe place to be. The mountains protect the city literally, and I guess you could say metaphorically, too.